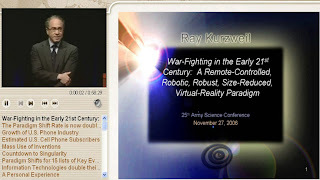 On Nov 27, 2006, Ray Kurzweil gave a presentation at the 25th Annual Army Science Conference. 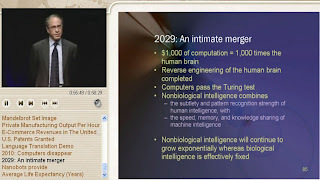 It's geared towards the military, but overall it's just Kurzweil's basic presentation on technology trends, the acceleration of progress, and what that will mean for the future of humanity. I made a video screen capture of his presentation hosted at the defense department's website, and modified it to include some extra video/slides. 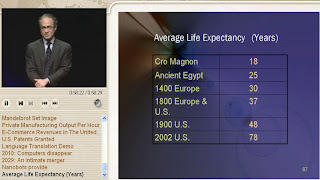 The highest quality version I could get where the detail of the slides is easily readable is available below as a .wmv file. 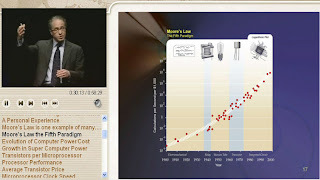 A .pdf of the powerpoint slides is available here. The 2006 Army Science Conference Website. Army Science Conference Introduction via Google Video. 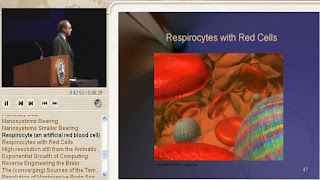 Thomas Killion's Presentation via Google Video. I wonder if man is doomed or if Reno Web Design can somehow transform man using marketing and branding. Great! Such a wonderful post. Thanks for sharing. In the future, anything can and will happen. More freedom may increase the chance that 'anything' has a positive outcome. If you find a broken link, or a new video that should go on the list, please email me!